Then, at last, the little girl meets up with the owner of the blue mitten and the lost mitten is reunited with its mate on a little boy’s hands. The little girl and the blue mitten boy become fast friends and soon they are making a snow baby, walking through the park, sledding down the hill together, and feeding the pigeons. Then it is home and time for hot chocolate party. The children sip their hot drinks and listen to the wind telling them that “more snow” is on the way. 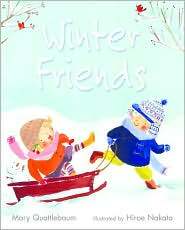 In this splendid book Mary Quattlebaum tells a charming story of a special snowy winter’s day using a series of image filled poems which roll off the tongue with ease and which, in the case of the hill sledding poem and several others, delight the eye as well. Readers will enjoy the way one can move from poem to poem as the little girl walks through the city streets from place to place, and as she has her little adventures with her new friend.